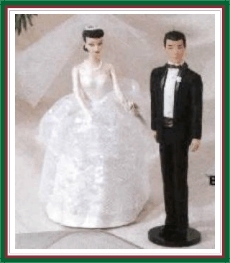 Hallmark Ornament - Barbie and Ken Wedding Day - Set of 2 Ornaments - Complements the Series - Handcrafted - Dated 1997 - Sculpted by Patricia Andrews (Barbie) and Don Palmiter (Ken) - QXI6815. What a beautiful day! What a wonderful couple! Barbie ® is a vision of fairly-tale dreams come true. Her formal wedding gown features a long-sleeved bodice and a two-tiered overskirt of lace. The gown was inspired by the original Barbie ® Doll Wedding Day Set fashion ensemble offered from 1959 to 1962. Ken ® is wearing a smartly tailored tuxedo with white dress shirt, maroon bow tie, and matching cummerbund. His formal wear was inspired by the Ken ® Doll Tuxedo ensemble introduced in 1961. This special commemorative set of Hallmark Keepsake Ornaments complement the Collector Series of ornaments which celebrate Barbie through the years. MIB with normal box aging. Has Price Tag. Has never been displayed.